One of the primary design goals of a domain model is to maintain the integrity of the model data, and to do so at a higher level than simple database constraints. A good domain model should be able to guarantee semantic consistency with respect to the business domain. Validation is an important tool for consistency guarantees, but something that is often overlooked is the role of object design. Many validation rules can be replaced by designing objects so as to make it impossible to get into an invalid state in the first place. This post is about a simple example of doing just that. If we set the company’s region, that setter automatically takes care of setting the company’s state and country to match. If we change the company’s country, on the other hand, we don’t know what state or region were intended. However, we set them to defaults that are at least consistent. The calling module can make a more considered choice at its leisure. So, with a little model support from the country and state – that is, the provision of a “default” option for state and region respectively – it is now completely impossible for our company to be in an inconsistent state, without ever needing to validate any inputs. Now we can only set the country by specifying a state. 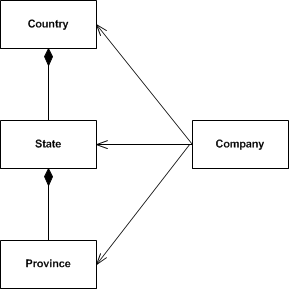 This more nearly matches the conceptual model, while retaining a country field in the company object for ORM purposes. This is a very trivial example, but the principle is extremely powerful. A domain model often can enforce complex domain constraints simply by its built-in behaviour, either by internally adjusting its state or by simply making invalid operations unavailable. When possible, this approach is greatly preferable to reactive validation, which can tend to require either complex dirty checking, or endless revalidation of unchanging data.